According to the pilot in command (PIC), he was conducting an instructional flight for his "new SIC (second in command)," and seated in the left seat. He reported that they had flown two previous legs in the retractable landing gear-equipped airplane. During the approach, he recalled that they discussed the events of their previous flights and had complied with the airport control tower's request to "keep our speed up". During the approach, he called for full flaps and retarded the throttle to flight idle. The PIC asserted that there was no indication that the landing gear was not extended, as he did not hear a landing gear warning horn; however, he was wearing a noise cancelling headset. He added that the landing gear position lights were not visible because the knee of SIC obstructed his view of the lights. He recalled that following the flare he heard the airplane propellers hit the runway, and he made the decision not to go-around because of the unknown damage sustained to the propellers. The airplane touched down, and slid to a stop on the runway. The airplane sustained substantial damage to the fuselage bulkheads, longerons and stringers. The SIC reported that the flight was a training flight in VFR conditions. He noted that the airspace was busy, and during the approach he applied full flaps, but they failed to extend the landing gear. He added that he did not hear the landing gear warning horn; however, he was wearing a noise cancelling headset. The Federal Aviation Administration, Aviation Safety Inspector that examined the wreckage reported that during recovery the pilot extended the nose landing gear via the normal extension process. However, due to significant damage to the main gear doors, the main landing gear was unable to be extended hydraulically or manually. He added that an operational check of the landing gear warning horn, was not accomplished because the wreckage was unsafe to enter after it was removed from the runway. Both pilots were wearing noise canceling headsets, and the landing gear warning horn is presented by an aural tone in the cockpit, and is not configured to be heard through the crew's headsets. When asked, the PIC and the SIC both stated that they could not remember who read the airplane flight manual (AFM) before landing checklist. 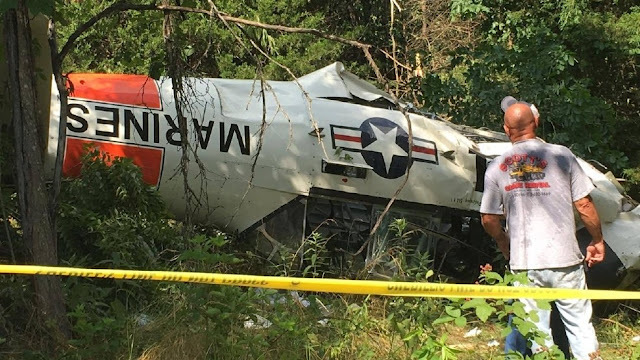 The owner of an air charter service crash-landed his plane at Republic Airport in Farmingdale Monday afternoon when his landing gear and a key part of his aircraft’s warning system failed, the pilot said. Ponderosa Air president Jan Nerud said he and a passenger pilot were not hurt but his 1978 twin-engine plane was “totaled” after it touched down about 6 p.m. at 125 mph and slid 2,000 feet on its belly. The gear horn, an “excruciating,” repetitive blast, failed to sound the alarm when his wheels did not lower, he said. 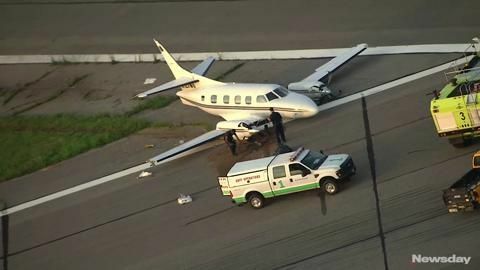 The Federal Aviation Administration is investigating why the Swearingen SW3 aircraft made a gear-up landing after flying from Westchester County Airport in White Plains to the company’s base in Farmingdale, an agency spokesman said. One runway was closed Monday as FAA investigators examined the plane. Nerud said he plans to switch to all office work starting in September at his Republic-based business and was getting his passenger, another experienced pilot, familiarized with the small plane so he could take over some flights. They were ending their 8-minute flight from Westchester with what started as a “perfect landing” and going over landing procedures when they got a jolt. Clouds of smoke billowed behind the plane from the friction with the tarmac. Jesse Kozak, 17, who works at Nassau Flyers, a flight training school, said he saw the crash and heard a screeching sound. Nerud said he had recently replaced entire systems on the plane, including $150,000 for avionics, the electronic systems that run communications, navigation, the display and other functions. Sounding philosophical about the hard landing, Nerud, 68, of Glen Cove said his plane’s gear horn and gear system had never failed him. “It’s just one of those things,” Nerud said. “It was a great landing, except for one thing — the gear wasn’t down. 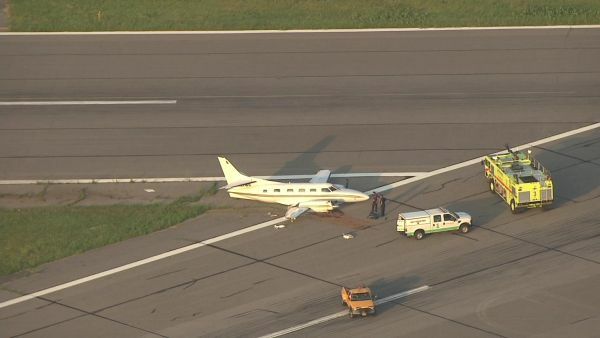 FARMINGDALE, Long Island -- A twin-engine charter airplane with two people on board made a hard landing with its gear up at Republic Airport on Long Island. The 68-year-old pilot, Ponderosa Air president Jan Nerud, said that he and his passenger were not hurt, but his plane was "totaled." Nerud said the plane slid about 2,000 feet on its belly after touching down at about 125 mph. Nerud said he was getting his passenger, also an experienced pilot, familiarized with the plane so he could take over some of the flights. An FAA spokesman says it happened at about 4 p.m. Monday. He says the Swearingen SW3 aircraft had taken off from Westchester County Airport in White Plains. One runway was closed as the FAA investigated the incident. 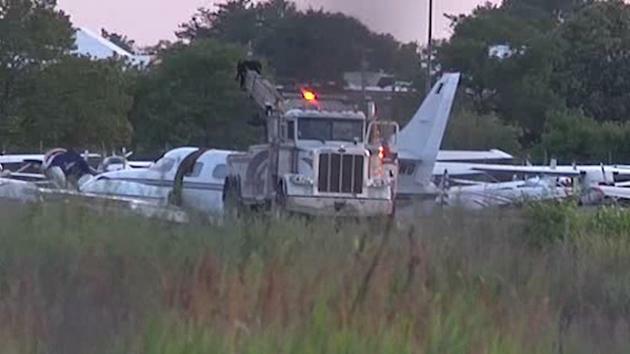 FARMINGDALE - Authorities say a plane made a hard landing with its gear up at Republic Airport Monday evening. 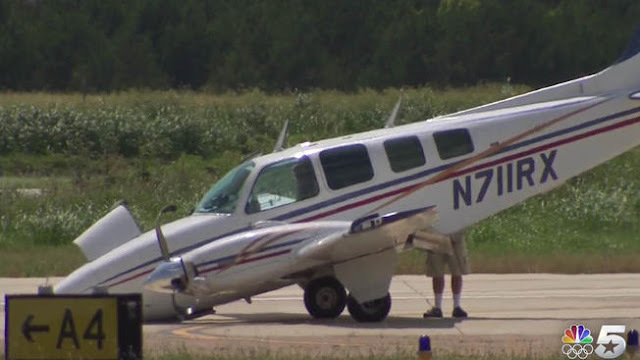 There were two people aboard the Merlin SW3 twin-engine plane when it skidded onto Runway 19 shortly before 6 p.m.
Airport officials say the plane skidded into the main runway intersection. All runways were closed to fixed-wing aircraft as a result of the incident. The FAA says the aircraft took off from Westchester County Airport in White Plains. The agency says it will investigate the incident. 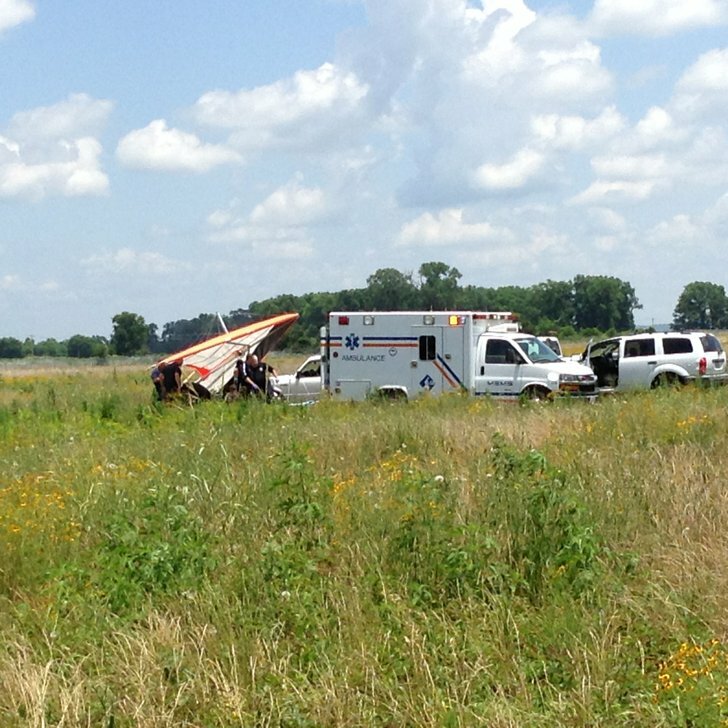 UNREGISTERED EXPERIMENTAL ULTRALIGHT CRASHED UNDER UNKNOWN CIRCUMSTANCES, THE 1 PERSON ON BOARD WAS FATALLY INJURED, NEAR CONWAY, ARKANSAS. A man was killed Monday when his ultralight trike crashed at the Conway airport. 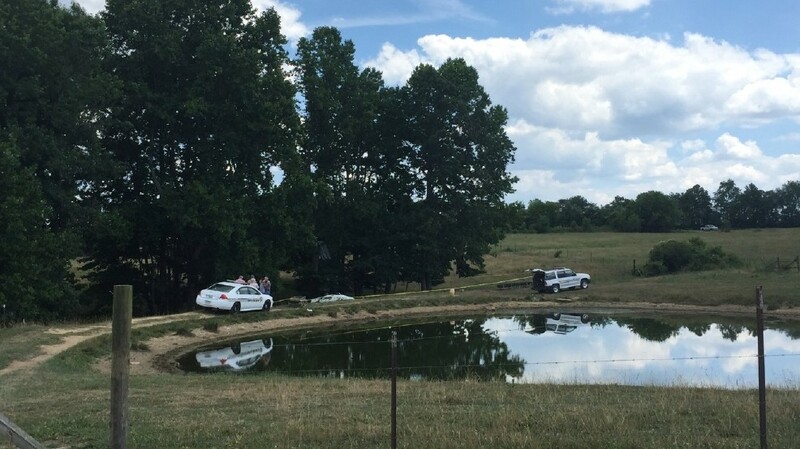 Adrian Clark, 64, of Cabot was killed around noon when the trike he was flying began to nose dive after reaching around 30 feet in altitude, according to witnesses. An ultralight trike is similar to a hang glider. The Federal Aviation Administration considers the craft unregistered and experimental and does not investigate when they crash. 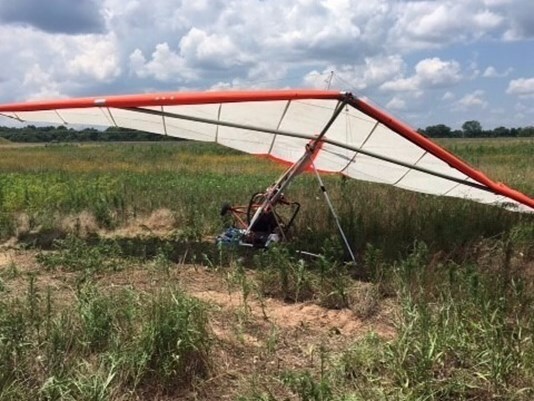 Officials said the Conway airport is not allowed to prohibit use from flying the ultralight trikes because it is a federally-funded, public-use airport. Two other men were at the airport with the pilot — one identified himself as the pilot’s son — when the craft went down. Clark was air evacuated to the University of Arkansas-Medical Services in Little Rock, where he died from his injuries late Monday afternoon. CONWAY, Ark. 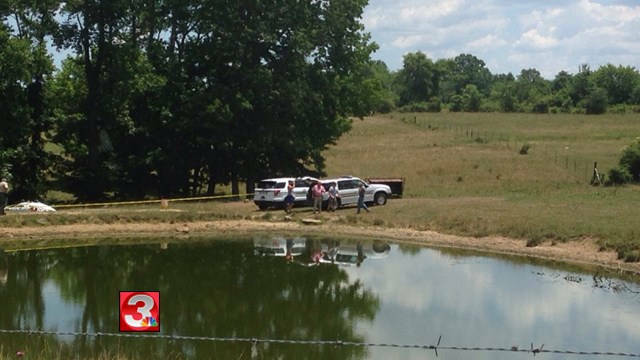 (AP) - Police in Conway say a Cabot man was killed when the ultralight aircraft he was piloting crashed at the Conway airport. Police spokeswoman LaTresha Woodruff says 64-year-old Adrian Clark died at a Little Rock hospital where he was taken after the crash about noon Monday. Woodruff says Clark was piloting a weight-shift-control trike. Woodruff says witnesses told police that the aircraft reached an altitude of about 30 feet, then nose-dived into the ground. Woodruff says the Federal Aviation Administration considers the aircraft unregistered and experimental and will not investigate the crash. Police said the pilot of a small aircraft that crashed at the Conway airport Monday died from his injuries. Conway police spokesman LaTresha Woodruff said 64-year-old Adrian Clark of Cabot died from the injuries sustained in the crash after being airlifted to UAMS Medical Center in Little Rock. Woodruff said witnesses saw a weight-shift-control trike, reach an altitude of 30 feet before nose-diving into the ground around noon. The FAA considers this type of craft as unregistered and experimental and won't investigate the crash, Woodruff said. Because the airport is a federally funded for public use, Woodruff said, police can't prohibit craft such as hang gliders. Police earlier identified the craft that crashed as a plane. CONWAY, Ark. (KTHV) – A man who was airlifted to a Little Rock hospital after his weight-shift-control trike crashed at the Conway Municipal Airport has reportedly died from his injuries. According to Conway Police Department PIO LaTresha Woodruff, the man was identified as 64-year-old Adrian Clark of Cabot. Reports stated that the aircraft was an weight-shift-control trike. Two other men were on scene with him when the crash occurred around noon. Witnesses indicated the craft reached approximately 30 feet before nose diving. Reports state that FAA considers the craft unregistered experimental and will not be investigating the incident. According to Conway city officials, because the airport is a federally funded public use airport, they cannot prohibit the flying of such crafts. LINTHICUM, Md. —A Boston-bound flight returned to Baltimore shortly after takeoff Monday evening. A Southwest Airlines representative told 11 News that the pilot of Flight 281 returned the plane to Baltimore-Washington International Thurgood Marshall Airport because of a cockpit indication light. The pilot did not declare an emergency, the airline said. As a precaution, emergency crews at the airport met the plane upon landing. The plane taxied to the gate under its own power. The 135 customers and five crew members were being switched to another plane. They are scheduled to arrive in Boston about two hours behind schedule. The original aircraft was taken out of service for a maintenance review. Another plane, Flight 605 from Philadelphia to Phoenix, was diverted to BWI-Marshall for a minor maintenance issue. Passengers and crew members were swapped to another plane, and were on the way to Phoenix. On June 20, 2016, about 1240 eastern daylight time, a Rockwell International 112A, N1299J, impacted trees during a forced landing following a total loss of engine power near Dayton, Tennessee. The private pilot was the only occupant and received serious injuries. Visual meteorological conditions prevailed and no flight plan was filed for the personal flight. The flight was conducted under the provisions of Title 14 Code of Federal Regulations Part 91. The flight originated from Whiteside County Airport – Jos H Bittorf Field (SQI), Rock Falls, Illinois, with an intended destination of Pickens County Airport (JZP), Jasper, Georgia. In an interview with a Federal Aviation Administration (FAA) inspector, the pilot stated that while en route, about 5,500 feet mean sea level, he heard a "pop" and the engine lost total power. He unsuccessfully attempted to restart the engine twice, and then he elected to land in a field. During the forced landing, the airplane impacted trees and subsequently the ground, which resulted in substantial damage to the fuselage, wings, and empennage. A postaccident examination by a FAA Inspector revealed that the wings, rudder, and horizontal stabilizer had separated from the fuselage. The engine remained attached to the fuselage and the propeller remained attached to the engine. Two of the three propeller blades were bent aft and the third blade was bent forward. Furthermore, an odor similar to aviation fuel was noted on scene. According to FAA records, the airplane was issued an airworthiness certificate on 1975, and registered to the corporation in 2003. It was equipped with a Lycoming IO-360-C1D6, a 180-hp, engine. According to the airframe maintenance logbook, the most recent annual inspection was performed on August 5, 2015, at a total time of 3,958.3 hours. At the time of the accident, the airplane had accumulated 4,046.7 total hours. The engine remained attached to the firewall through the engine mounts. It was partially disassembled to facilitate examination. The propeller rotated without anomaly and crankshaft continuity was confirmed to the accessory section of the engine. Compression and suction was confirmed from all cylinders. The interior of each cylinders was examined with no anomalies noted. The fuel servo was partially impact damaged, the fuel servo throttle arm was in the full throttle position, and the servo mixture control arm was in a full rich position. The servo fuel inlet screen was removed and unobstructed. The fuel flow divider remained attached to the engine, no damaged was noted, was disassembled, and the fuel diaphragm was intact with no debris noted. The fuel injector nozzles were removed and were unobstructed. The engine-driven fuel pump remained attached to the engine and was removed for further examination. When the engine-driven fuel pump was placed in a bucket of water and operated by hand, no water was expelled from the outlet port. The engine was equipped with an Aero Accessories engine-driven fuel pump with the Part No. AF-15473. It was manufactured in 2011 and installed on the engine during an overhaul on March 8, 2011. At the time of the accident, it had accumulated 438.6 hours of total time. According to the manufacturer, it was to be overhauled every 12 years or 2,000 hours, whichever came first. The engine-driven fuel pump was further examined at the manufacturing facility under federal oversight. Visual inspection of the exterior revealed that the lower panel that covered the bottom of the pump was impact damaged. The mechanical fuel pump arm exhibited wear in the area that contacted the engine and no anomalies were noted. The engine-driven fuel pump was mounted on a flow test bench, however, it would not flow. Further disassembly revealed that the stamp ring attached to the top of the diaphragm actuator rod of the fuel pump was deformed. In addition, the fiber spacer or washer were not located. As a result of the deformation, where the actuator met the diaphragm lift stem, the engine-driven fuel pump was unable to actuate the diaphragm element and pump fluid. The engine-driven fuel pump was sent to the NTSB Materials Laboratory for further examination. The examination revealed that the actuator fracture was generally circular in orientation, was slanted, and had indications of localized plastic deformation adjacent to the facture surface. The retainer section, that had separated from the stamp ring but remained attached to the actuator, exhibited damage to parts of the fracture surface and was smeared, consistent with post fracture contact with the adjacent components. The undamaged areas exhibited river patterns and chevron marks. In addition, the areas not damaged were examined with a scanning electron microscope, and exhibited dimple rupture, which is consistent with an overstress fracture. The airplane was equipped with a J. P. Instruments EDM-800, which was panel mounted and recorded up to 24 parameters related to engine operations. The unit contained non-volatile memory for data storage of the parameters recorded and calculated. The data extracted included the accident flight starting 09:38:54 and ending 12:51:47 on June 20, 2016. The data indicated that just after 1251, the fuel flow decreased to zero and the EGT and CHT values decreased as well. In an interview with a Federal Aviation Administration inspector, the pilot stated that while en route, about 5,500 feet mean sea level, the engine lost power and he elected to land in a field. During the forced landing, the airplane impacted trees and subsequently the ground, which resulted in substantial damage to the fuselage, wings, and empennage. A witness reported that the airplane was flying low, slow, and seemed to be flying in a circle until it impacted trees. A postaccident examination revealed that the wings, rudder, and horizontal stabilizer had separated from the fuselage. The engine remained attached to the fuselage and the propeller remained attached to the engine. Two of the three propeller blades were bent aft and the third blade was bent forward. Furthermore, an odor similar to aviation fuel was noted on scene. UPDATE: According to a Rhea County Sheriff's Department report, 71-year-old Theodore Owens is the pilot who crashed a Rockwell International 112A aircraft on Monday near Walkertown Road on Dayton Mountain. He was transported for his injuries to Erlanger Medical Center. He's listed in critical condition. Owens is from Jasper, Georgia and told authorities he was flying back from Illinois. He told first responders about his left arm hurting when they arrived. When they asked what had happened, Owens wasn't sure and said he didn't remember anything. 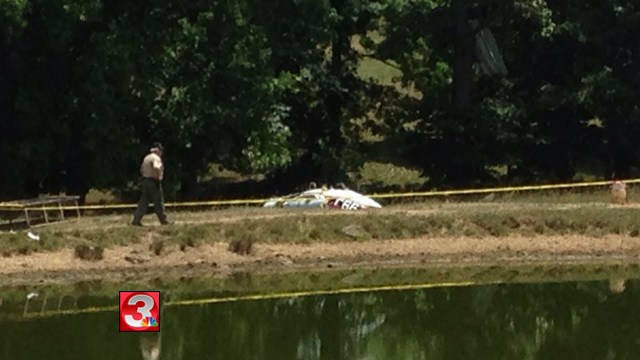 PREVIOUS STORY: A pilot is recovering after a plane crash in a rural part of Rhea County. It happened just before 1:00 p.m. on Monday near Walkertown Road on Dayton Mountain. The Rhea County Sheriff's Office said the pilot was traveling to Atlanta from Illinois when he suddenly crashed. Channel 3 spoke with 23-year-old Meredith Farnsworth who called 9-1-1. "I was laying out tanning by the pool and there was a plane that flew very low, which happens kind of often around here, but I heard the crash and that's what triggered me to go run across the field to find it," Farnsworth said. She rushed over to check on the pilot and talked with him until medics could arrive. Farnsworth said he appeared to be relaxed, given the situation. "His left arm was broken, very likely at least. His face was cut up. Things like that, but mentally he was alert and he was with me, so, really, that was the important part, I think," Farnsworth said. Federal Aviation Administration officials said the plane was a Rockwell International 112A aircraft. It's registered with the FAA under a business named JKM Enterprises, Inc. out of Rock Falls, Illinois. "You only see plane crashes in movies and things like that, so to see it in person was definitely an experience. It was new," Farnsworth said. The Sheriff's Office said the pilot had no one else in the plane with him. His identity hasn't been released yet. The pilot was taken to the hospital. His condition isn't known. The FAA is also investigating the crash. Plane crash investigators are en route from Chattanooga to Dayton Mountain in Rhea County to find out what caused a small, single-engine plane to crash a little after lunchtime today. Rhea County Sheriff's Office investigator Rocky Potter said the pilot of the plane, identified at this point as a Georgia man, survived the crash with a suspected broken arm. Potter said the aircraft was a single-engine plane with only the pilot aboard. No one else was injured and there was no known damage to property on the ground. "A witness said they could hear the plane come in real low," Potter said. The aircraft hit the ground soon afterward. Rhea County dispatchers said the crash was reported at 12:42 p.m. by a Walker Town Road resident living near Cranfield Road. The plane crashed somewhere around the 1700-block. Potter said some county officers were working on an unrelated matter nearby and were able to respond to the crash scene quickly. They met the landowner who had already opened a gate to let emergency officials reach the plane and injured pilot, he said. Potter said the man was transported to Erlanger Hospital in Chattanooga for treatment. Potter said officials at the scene said the man seemed "disoriented." "They say he took a heck of an impact," Potter said. National Transportation Safety Board officials are en route to the crash site from Chattanooga to investigate, he said. AIRCRAFT ON TAXI, RIGHT WHEEL CAUGHT FIRE, EXTINGUISHED, DAMAGE UNKNOWN, ALBUQUERQUE, NEW MEXICO. AIRCRAFT LANDED AND THE GEAR COLLAPSED, DALLAS EXECUTIVE AIRPORT, DALLAS, TEXAS. An airplane made an emergency hard landing at the Dallas Executive Airport at about 3 p.m. on Sunday. According to Dallas Fire-Rescue, it will “take more than a tug” to get the plane off of the runway after it had apparent landing gear problems. Nobody was injured, but some of the runway remained shut down as of 4 p.m. and certain flights are being rerouted to Grand Prairie. AIRCRAFT FORCE LANDED IN A FIELD, NEAR TEXAS CITY, TEXAS. AMERICAN AIRLINES FLIGHT AAL1051 MCDONNELL DOUGLAS MD 83 AIRCRAFT, REGISTRATION NOT PROVIDED, PITOT TUBE SUSTAINED MINOR DAMAGE DUE TO A BIRDSTRIKE, RETURNED AND LANDED WITHOUT INCIDENT, NO INJURIES, NEWARK, NEW JERSEY. AIRCRAFT ON LANDING NOSE WHEEL SEPARATED FROM GEAR, SANTA FE, NEW MEXICO. The airline transport pilot reported that, about 30 minutes into the local flight, the engine experienced a total loss of power, and he conducted a forced landing to a powerline cut. He stated that the airplane was at low altitude at the time of the loss of engine power because he had been taking photos of a friend’s farm. Because no anomalies were found during the examination, it is likely that the loss of engine power was a result of fuel disruption to the engine during the extended inverted flight. The pilot’s decision to conduct extended inverted flight, which resulted in a total loss of engine power due to fuel flow disruption. Contributing to the accident was his decision to conduct aerobatic maneuvers at low altitude, which precluded him from selecting a suitable landing site following the total loss of engine power. 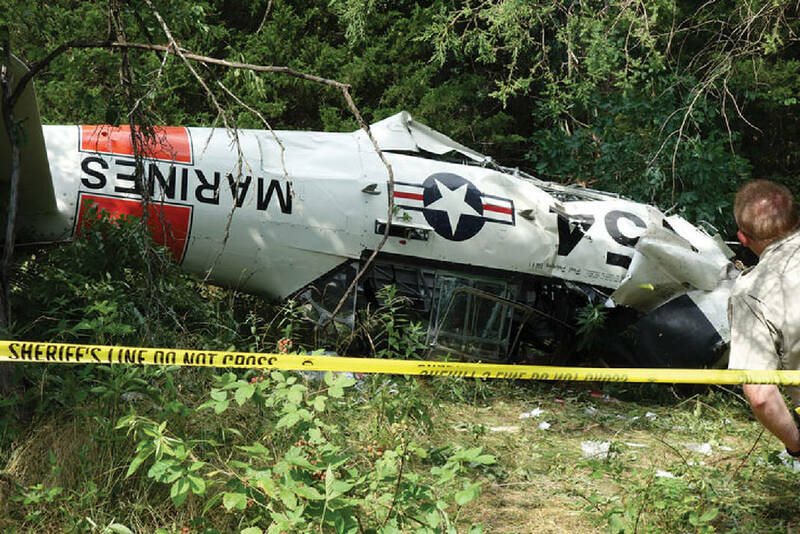 On June 19, 2016, about 1440 central daylight time, a North American AT-6D, N150U, sustained substantial damage when it impacted trees while maneuvering at a low altitude near Henley, Missouri. The pilot and passenger received serious injuries. The airplane was registered to Ozark Management Inc. and operated by the pilot under the 14 Code of Federal Regulations Part 91 as a personal flight. Visual meteorological conditions prevailed and no flight plan was filed. The airplane departed from the Jefferson City Memorial Airport (JEF), Jefferson City, Missouri, at an unknown time on a local flight. A deputy of the Cole County Sheriff's Department reported that about 1410 he observed an aircraft flying about 1,500 ft above ground level (agl). He stated that he observed the airplane perform an aerobatic maneuver – a loop. The airplane then departed from his view to the north behind his car. He rolled down his car window and said that the engine sounded like an "old P-51 Mustang." 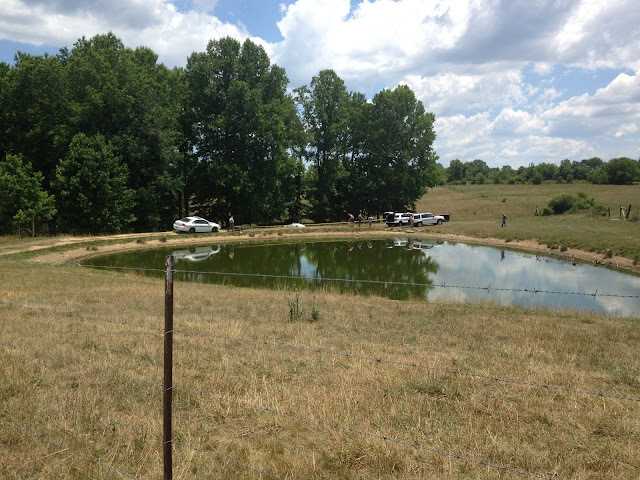 The deputy was later notified by dispatch about 1445 that an airplane accident had occurred. He arrived at the scene about 1453. He noted that the accident aircraft was same type of WWII airplane and had the same markings as the one he had observed at 1410. A Federal Aviation Administration (FAA) inspector interviewed a witness who observed the airplane before it crashed. The witness stated that she observed the airplane flying at a low level over the farm fields near her property. She stated that the airplane was so low that it startled her horses as it flew overhead. She stated that the engine was operating as it flew overhead. Then she observed the airplane fly inverted, but she was not sure how long it was inverted. The airplane's engine became silent shortly after it went inverted. The airplane lost altitude while still inverted and she heard a crashing sound as it impacted the trees. FAA inspectors examined the airplane wreckage at the accident site. The inspectors reported that the airplane crashed into a wooded area. The initial point of impact was a tree about 325 ft south of the main wreckage. The debris field extended about 300 feet south of the aircraft's final resting place. There was a strong odor of fuel and oil in the immediate area of the aircraft fuselage which was found inverted in a clearing. The left wing was separated from the fuselage and was lying adjacent to the fuselage. The right wing had separated from the fuselage and was lying approximately 50 feet south of the aircraft. The main landing gear were still mounted to the underwing structures and were in the retracted position. The forward cockpit had sustained significant impact damage. The pilot seat was intact, but broken from its mount with the seatbelts intact. The instrument panel was broken and most the instrument gauge glass was broken; the switches were crushed; and all the circuit breakers were pushed in (not popped). The fuel selector was set to the 20-gallon reserve setting. The flap handle was found in the up position; the throttle was full open; the mixture was full rich; and the RPM setting was in the mid position between increase and decrease. The rear cockpit had minor damage to the structure surrounding the occupant. The seat was intact on its mount and the seatbelts were also intact. The cockpit glass on the entire cockpit was broken. The aircraft engine cowling was severely damaged. The propeller blades were bent aft and had minimal chordwise scratching or leading edge nicks or gouges. The engine fuel filter assembly was examined. The filter had minor debris present. The electric fuel pump was examined and the shaft was manually rotated. The fuel pump operated properly and moved the residual fuel it contained from one side of the pump to the other. The North American AT-6D Flight Operating Instructions listed prohibited maneuvers. The prohibited maneuvers included: 1) outside loops, 2) inverted flight in excess of 10 seconds, 3) snap rolls in excess of 130 mph, 4) slow rolls in excess of 190 mph are prohibited, and 5) spins and stalls when normal gross weight is exceeded. The operating instructions also included this statement: "Inverted flying must be limited to 10 seconds because of engine difficulties resulting from prolonged inverted flight." FAA inspectors interviewed the pilot and passenger. Neither remembered what occurred during the accident, but they stated that no aerobatic maneuvers were flown during the accident flight. In a written statement, the pilot made the following statement, "Sightseeing trip, about 30 minutes into the flight the engine made a pop and the prop stopped. I was low from taking pictures of a friend's farm. We forced landed into a powerline cut. That's the last I remember." The pilot also stated that the cause of the engine's loss of power could be attributed to the corrosion of the supercharger bearings, which when they fail, it causes the supercharger to wobble. The supercharger then starts to contact the engine case causing fine metal filings to build in the oil which results in the engine failing from oil starvation. At 1353, the surface weather observation at JEF was: wind 200 degrees at 10 kts; 10 miles visibility; few clouds at 5,500 ft; scattered clouds at 7,000 ft; temperature 32 degrees C; dew point 19 degrees C; altimeter 30.17 inches of mercury. On June 19, 2016, about 1445 central daylight time, a North American AT-6D, N150U, sustained substantial damage when it impacted trees while maneuvering at a low altitude near Henley, Missouri. The pilot and passenger received serious injuries. The airplane was registered to Ozark Management Inc. and operated by the pilot under the 14 Code of Federal Regulations Part 91 as a personal flight. Visual meteorological conditions prevailed and no flight plan was filed. The airplane departed from the Jefferson City Memorial Airport (JEF), Jefferson City, Missouri, at an unknown time on a local flight. A single-engine airplane crashed onto a farm in southern Cole County Sunday afternoon, and the two passengers were flown by helicopter to University Hospital with potential life-threatening injuries. The National Transportation Safety Board did not travel to the scene of this accident. 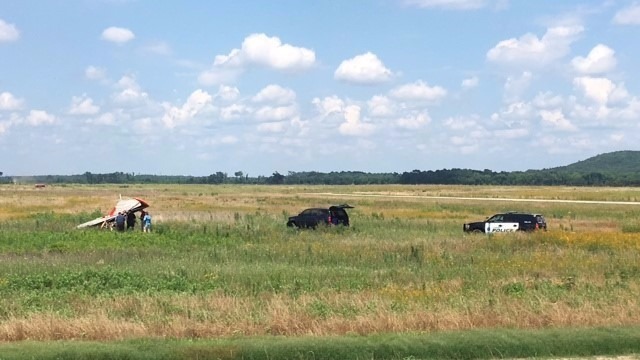 A single-engine airplane crashed onto a farm in southern Cole County Sunday afternoon, and the two passengers were flown by helicopter to University Hospital with potential life-threatening injuries. COLE COUNTY, Mo. - UPDATE 6/20: Authorities have identified the two people on board a small plane when it crashed Sunday. Capt. John Wheeler with the Cole County Sheriff's Department says 33-year-old John Abbott and 68-year-old Mark Blume were the two men on board during the crash. They say Abbott was the pilot and Blume was the passenger of the plane. A family member tells us the two are related by marriage. Abbott is apparently Blume's daughter's husband. ORIGINAL: A single-engine plane crashed in southern Cole County around 2:30 Sunday afternoon. The plane crashed in the 1600 block of North Teal Bottom Road in Henley. Cole County Fire Protection District Assistant Chief Mike Rackers said a man in his 30's and another man in his 60's were inside the plane. The men were flown to University Hospital for immediate surgery. Capt. John Wheeler with the Cole County Sheriff's Department said the crash area is now blocked off until the Federal Aviation Administration comes to investigate. Wheeler said FAA officials will be at the site Monday. Rackers said a hazmat crew is responding to the scene to stop a fuel leak. He said there was no fire after the crash. Both the pilot and co-pilot had managed to get out of the mangled plane and were tending to each other's injuries when emergency responders arrived at the scene, said Mike Rackers, assistant chief of the Cole County Fire Protection District. The victims' names were not released on Sunday, but both were men — one apparently in his 30s and the other in his 60s. "The aircraft is in pretty bad shape," said Capt. John Wheeler with the Cole County Sheriff's Department. "I was very surprised to hear that the individuals were actually out of the aircraft and tending to themselves. The pilot, I think, must have done a pretty good job trying to set it down and keeping them out of danger. That or the grace of God, because the aircraft is pretty torn up." The only call received by authorities was from the property owner, who saw a low-flying aircraft then heard a loud crash at about 2:30 p.m. The property is located near Henley, at 1610 N. Teal Bottom Road, near its intersection with South Teal Bottom. One of the men had injuries to his chest and face, while the other suffered an impalement to his head, possibly from a stick, said Kevin Wieberg, public information officer for Cole County Emergency Medical Services. "Both were conscious upon our arrival," Wieberg said. "They did treat each other, rendering first aid. Our units both cared for the patients and were able to successfully and safely load them on the helicopters and get them to the University (Hospital) and get them further care." The two-seat aircraft has the words "MARINES" across it, the number 54 and a World War II-era star and bars emblem. Also written on the plane under the cockpit area was "Paul Poberenzy EAA #1." Poberenzy founded the Experimental Aircraft Association, and died at the age of 91 in 2013. "When we arrived, we found both patients out of the plane. They were tending to each other, and we started patient care," Rackers said. "Air ambulance" helicopters responded from Lake Regional Hospital and University Hospital in Columbia, Wieberg said. Each transferred one patient. Both patients were responsive and alert, but had potentially life-threatening injuries, he said. His agency turned over the scene to the Cole County Sheriff's Department, which secured the area and will turn the scene over to the National Transportation Safety Board today for investigation into the cause of the crash. It was a sunny day, but Wheeler, who has military experience in aviation, said there could be a number of potential causes. "There's a plethora of things that could happened," Wheeler said. "Flight control issues. Engine issues. We'll have to wait for the FAA to come in, and they'll question everyone who was at the scene today." Wheeler said his department has been in contact with the Federal Aviation Administration, which will be on the scene tomorrow to start its investigation. The crash was about a third of a mile down a private drive, and not near any residential structure. The area was cordoned off with tape, and no one was being allowed to touch the aircraft until the FAA arrives on the scene, Wheeler said. Most of the plane appeared to be intact, but Wheeler said several pieces were broken off. Three Rivers Electric was also on the scene, because officials believe a high-wire was taken down by the plane. Both Three Rivers and the Cole County Fire Protection District have locations just a few miles from the site of the crash. 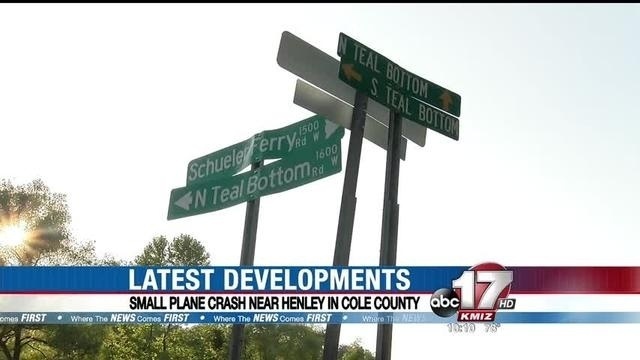 Wheeler said he can't recall another downed plane while working for Cole County, other than a call about seven years ago that turned out to be a false alarm. Back when he worked for the Jefferson City Police Department, he said, there was a small plane crash in the city. "It is a rare occurrence," he said. "And everyone's just thankful that, No. 1, someone saw the aircraft flying low like that. So luckily, we had some people who were able to locate the aircraft in a quick time and let these people (first responders) do their job, a phenomenal job, in getting those two victims to the hospital."